-- Select a Size -- 6"-10" - Out of Stock! 10"-16" - Out of Stock! 14"-20" - Out of Stock! 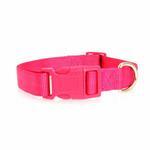 18"-26"
Add some color to your dog's day with the Zack & Zoey Nylon Dog Collar in Raspberry Sorbet! Our Zack & Zoey Nylon Dog Collars are durable and fashionable basics but this Raspberry Sorbet color is anything but plain! This lovely shade of bright pink matches all of our raspberry-colored fashions. This hot pink color is a great choice for getting your girl noticed and supporting girl-powered events. 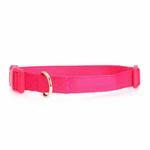 We love this raspberry pink dog collar year-round, but we especially find it fun for Valentine's Day, Easter and during the warmer months. It's a great choice for tropical vacations! Nylon Dog Collar by Zack & Zoey - Raspberry Sorbet Customer Photos - Send us your photo! One year old 12/31/2015. 125 pounds, 37" tall. ZoeBel my 5 year old Old English Bulldoggie little girl looks pretty in her Raspberry Sorbet necklace. Zoey is a spunky little Boston Terrier. She loves to chew.... EVERYTHING! Lola's raspberry sorbet collar matches her bubbly personality! Raspberry Sorbet never tasted so good! Collar hardware matches nylon, which is wonderful! Posted On 08/29/17 by Janice W from Hallettsville, TX Yes, Janice W recommends this product! Good solid color collar that matched the trim on our Bella's leash. I needed a back up collar while one was being washed. I wanted a 3/4" wide but wasn't available in this color. Posted On 08/05/17 by Terri P from , Yes, Terri P recommends this product! This collar is a beautiful, rich raspberry pink color and looks stunning on my new little puppy girl! Posted On 02/10/17 by Todd D from Katy, TX Yes, Todd D recommends this product! Posted On 04/25/16 by Molly N from Castle Rock , CO Yes, Molly N recommends this product! These little collars are perfect for my Toy Dachshund. They are really inexpensive, yet well made. Posted On 10/21/15 by Jill F from Jacksonville, FL Yes, Jill F recommends this product! Got several collars for Lexi and this one is great also! Fits well and looks so cute. Posted On 09/14/15 by kathleen m from camano island, WA Yes, kathleen m recommends this product! Love the color, and the size is perfect for my pom-chi! However, this is very thin, much thinner than any of my other collars. It will work for this small dog. Thank you! A nice light weight collar. The raspberry color looks great on my dog. Posted On 07/13/15 by NANCY L from Indian Land, SC Yes, NANCY L recommends this product! Love the collar.... the color is vibrant. Candy loves it. Posted On 06/21/15 by Jr Wiese from Chandler, AZ Yes, Jr Wiese recommends this product! Posted On 06/13/15 by Marcia G from Phoenix, AZ Yes, Marcia G recommends this product! Wonderful for my little Chihuahua girl! This raspberry pink dog collar was given to a local pug rescue, and it is being well used! This collar is well made and sturdy--it will last a long, long time. The color is nice and vibrant, just what any dog wants! Such a good collar, I got this one as a spare! Posted On 11/08/13 by Carolyn B from , UT Yes, Carolyn B recommends this product! I bought this kitten collar in raspberry sorbet and bluebird colors after two months of frustration with a break-away collar from a local pet supply store. The bad collar had a poorly designed catch and my kitten pulled it off with a swipe of her capped claws. This new collar (we are using the bluebird color first), is sturdy and I can keep it adjusted loose enough to come off with my kitty's weight, but tight enough to stay on when she tries to casually squirm out. Cute, affordable, simple collar. Great Price and fat shipping! !